While researching the impact that World War One had on Greenwich Village, I came across the Abingdon Square Doughboy. 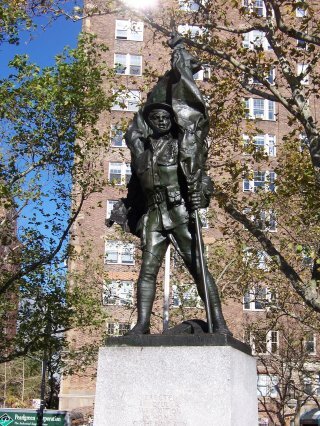 This statue, located in Abingdon Square Park near the intersection of 8th Avenue and Hudson Street, was commissioned by the residents of Greenwich Village in order to memorialize the soldiers from their neighborhood who had lost their lives during World War One. However, the Doughboy is connected to the Village in more ways than one. The sculptor who created this particular memorial was a man named Philip Martiny, whose studio was located on MacDougal Alley. Martiny was born in 1858 in France, where he trained under a sculptor by the name of Eugene Dock. At age 20, he immigrated to America for what was, in his own words, “the most sordid of reasons:” to evade army service in France. Upon his arrival in America, Martiny began to study with the sculptor Augustus Saint-Gaudens, who was widely considered to be one of the greatest American sculptors of the Beaux Arts movement. He proved to be an adept student, and by the early 1900’s, Martiny had already received a number of very prominent commissions. The turn of the 20th century was a good time to be a sculptor in America, and even more so in New York City. The Beaux Arts movement, with its goal of beautifying urban environments, was in full swing in New York. Beautifully decorated classical style buildings were popping up like daisies, and sculptors were in high demand. Martiny, having been trained by the great Saint-Gaudens, was a highly sought out sculptor for the Beaux Arts projects being erected all over Manhattan. He created a number of sculptures to be placed on the Chamber of Commerce building on Liberty Street in Manhattan. These sculptures have disappeared from the side of the building, though, and their current location seems to be a bit of a mystery. All that remains on the Chamber of Commerce building are empty spaces between the columns where the statues were formerly housed. However, Martiny’s work is still visible elsewhere in the city. He, along with other famous sculptors of the day, created sculptures to grace the outside of the Appellate Court on 25th Street and Madison Avenue. He also designed the eagles that decorate the famous Greenwich Village Landmark: the Washington Square Arch. The Arch would have been just a short walk from Martiny’s studio on MacDougal Alley. The alley was a busy place in the early 1900’s. A New York Times reporter remarked that the street had “quite as many stables as studios.” Martiny’s studio, though, was unique. By 1904, Martiny was receiving so many commissions that he had to hire an office staff of accountants to process them all. Perhaps Martiny’s status as a local helped him gain one of the last commissions of his career. The Jefferson Democratic Club selected Martiny to create a World War I memorial across from their headquarters on West 12th Street. Martiny accepted the commission and in 1921, the Abingdon Square Doughboy was dedicated. It stands proudly in the park until this day, reminding the Village of their lost sons and the local artist who immortalized them. New York Times, “A Sculptor Who is Also a Captain of Industry,” March 27, 1904. http://query.nytimes.com/mem/archive-free/pdf?res=F40716FB355F13718DDDAE0A94DB405B848CF1D3 (accessed September 30, 2013). “Abingdon Square Monuments – Abingdon Square Doughboy : NYC Parks.” New York City Department of Parks & Recreation. http://www.nycgovparks.org/parks/abingdonsquare/monuments/1942 (accessed October 1, 2013). Cauldwell, William . “Philip Martiny.” The Succesful American, January 1902. Van Alfen, Peter. “Monuments, Medals, and Metropolis, part I: Beaux Arts Architecture.” ANS Magazine 2, no. 2 (2003): 17-23. http://ansmagazine.com/Summer03/Monuments (accessed September 29, 2013). “War Memorials in Parks : NYC Parks.” New York City Department of Parks & Recreation. http://www.nycgovparks.org/about/history/veterans#world-war-I (accessed October 1, 2013).